A Lot About A Lot Of Honey Containers. The history of the Anchor Hocking Glass Corporation of Lancaster, Ohio is one of uniting mergers. They had mergers as early as 1873, but the home office started in 1905. 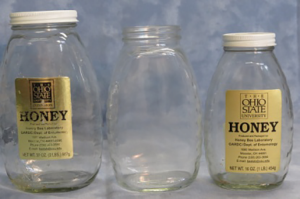 There are four different honey jars on display that were made by the Anchor Hocking Glass Corporation although they concentrate in making serving pieces of glassware. 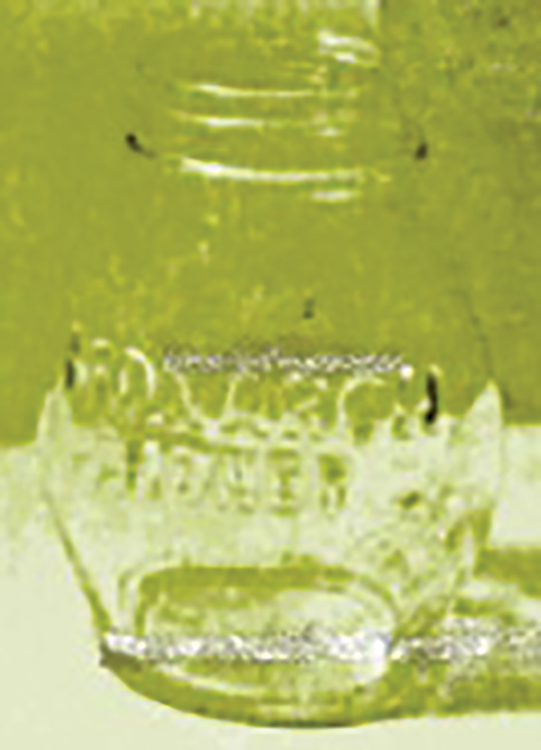 The trademark indicates that the jars were made during the time period of 1937 to 1968. 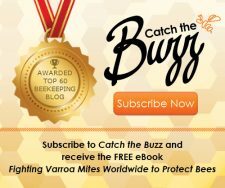 The honey jars on display have a honey comb pattern on the top and bottom parts of the jar and a honey bee perched on the comb. 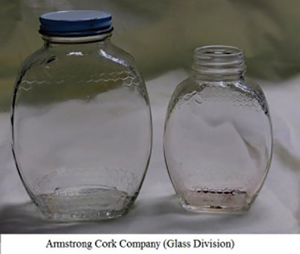 One jar indicates that a patent has been applied for and carries a model number of 1232 and is estimated to have been made in 1944. Two jars carry a model number of L-627A and L-628A and the fourth jar was made in the Salem, New Jersey plant in mold number 5965 characterized by the four bands at the base. 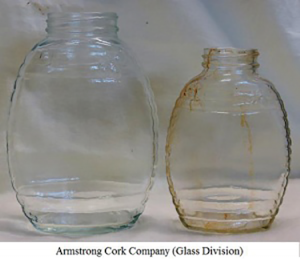 The Armstrong Cork Company of Lancaster, Pennsylvania made the two jars that are on display. 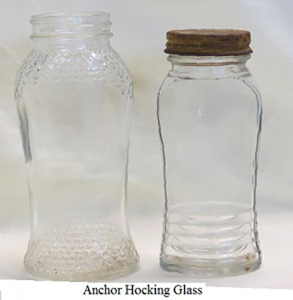 The smaller Jar is approximately 5¼” tall and the larger one is 6¼” tall. They were made in a two piece mold that left a line in the center of the side. The top and the bottom of the jars have three bands to indicate layers of a skep and there is a bee in the upper right hand “corner” of the jar. Started out in 1907 as Brockway Machine Bottle Company and became Brockway Glass Company in 1933. In 1959 the Brockway Glass Company acquired Tygart Valley Glass Company. Brockway Glass was in business until 1988, in Brockway, Pennsylvania. The typical manufacturers mark was a “B in a circle”; however the embossed word “Brockway” in a cursive form was used from 1950 to 1970. The bottle type 2932 is a 12 oz. honey jar with a honey comb pattern embossed on the jar. One of the bottles on display was used by the T.W. Burleson & Son Inc., of Waxahachie, Texas. 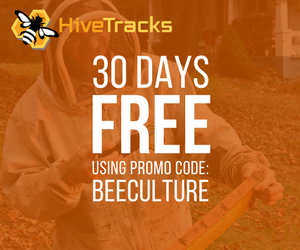 They have been in business since 1907 and supply extracted and whipped honey. This bottle is estimated to have been used in 1940. 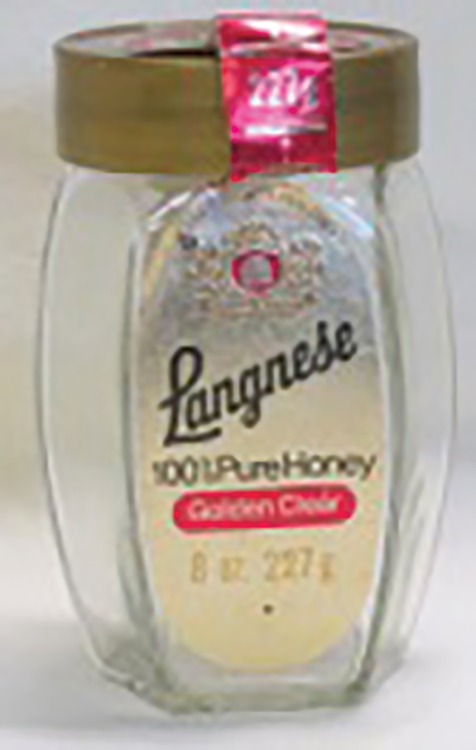 A larger bottle, number 1593 holds one pound of honey. 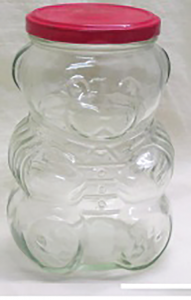 Brockway Glass was also a producer of the Queenline glass jar. 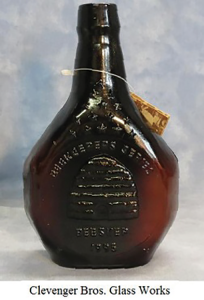 The bottle that is 53/8” tall was made in the Muskogee, Oklahoma plant in 1944. 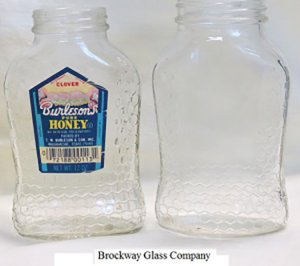 Brockway Glass also makes the regular five pound glass jar. 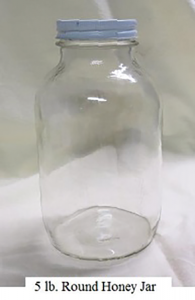 This jar looks very similar to a half gallon mason jar, but it is slightly smaller. The Clevenger Brothers Glass Works in Clayton, New Jersey started in 1930 and continued in operation until August 24, 1999. They specialized in making free and blow molded pieces using the old glass formulas and procedures. Thus the glassware pieces were authentic antique reproductions. 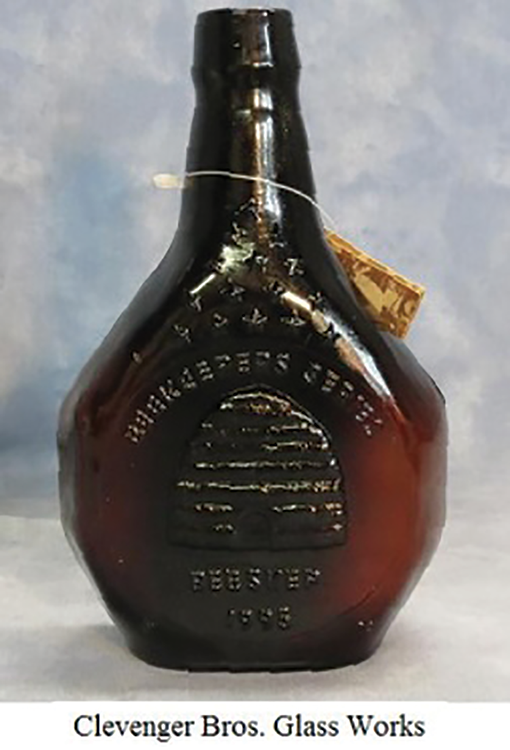 The amber colored bee skep honey bottle was a limited edition ordered by Clarke County Store of Richwood, New Jersey and made in 1995. There are no markings on this container, but it is believed to have held honey. A long time procedure is to design or choose a container that is unusual so people will buy the product for the container rather than the product. 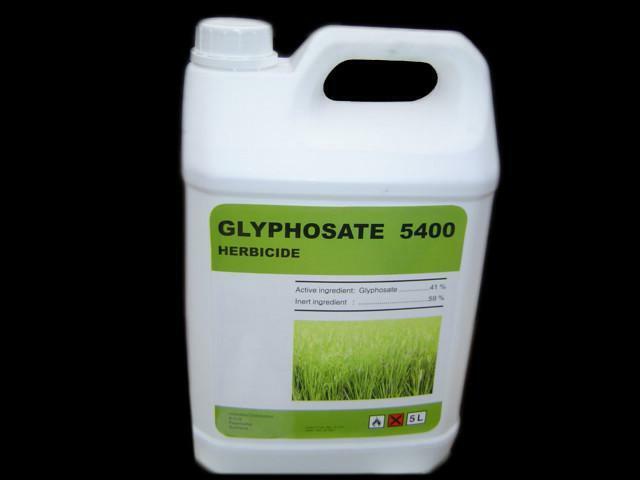 If you analyze this container, one wonders what product it would really be suited for. 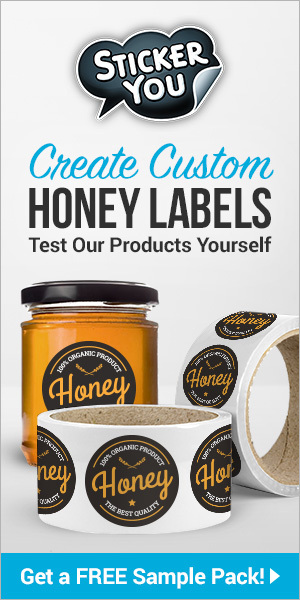 There are no manufacturer’s marks so an absolute identification is impossible. 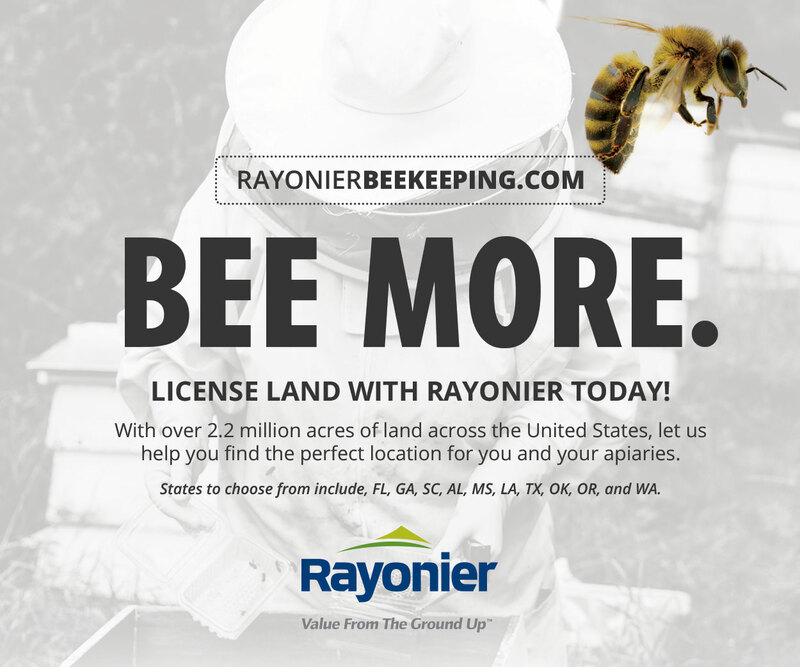 The Gamber Classic Jar is available from most bee supply dealers. These jars are made in different sizes and have been approved as another display container at most honey shows. 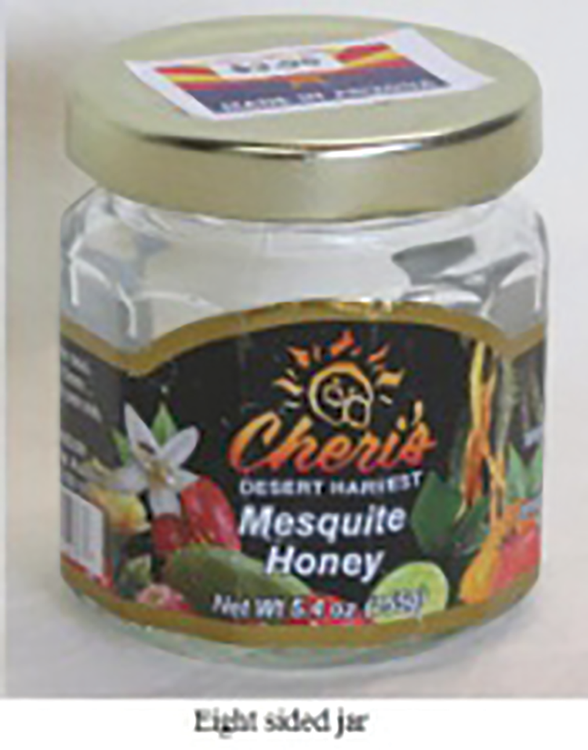 Since they are slightly thinner in total thickness than a queenline jar, the same honey will appear lighter in color. Later became known as Glass Containers Corporation which was in operation from 1934 to 1968 in Fullerton, California. 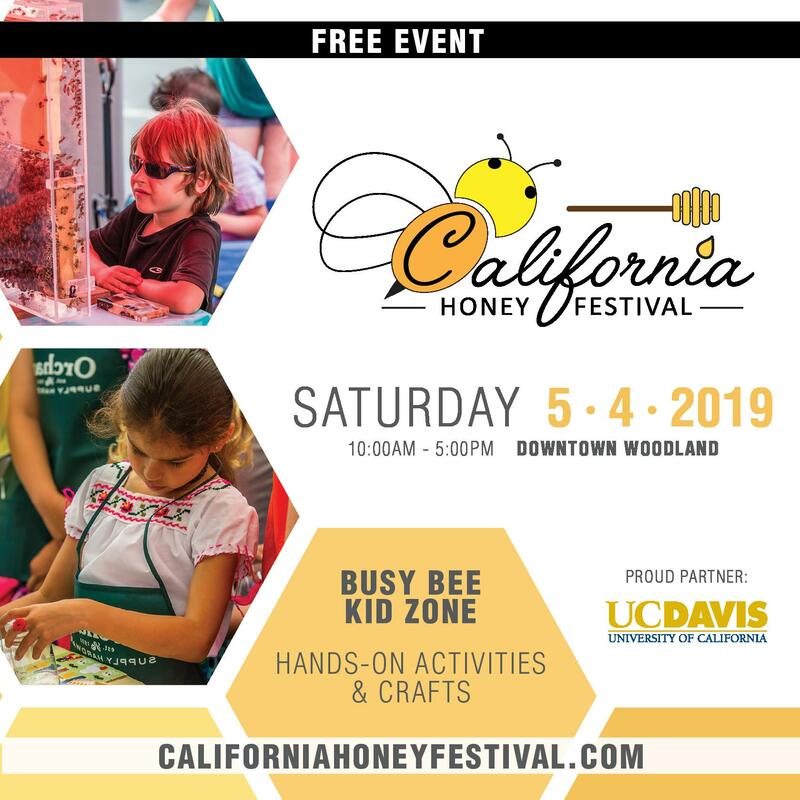 The honey sample bottle is from the Evans Honey Company of Los Angeles and advertised as California Orange Blossom Honey. 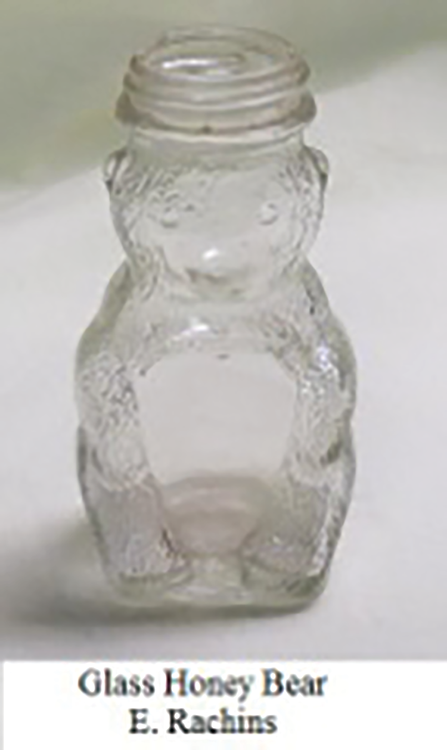 The glass honey bear was designed by E. Rachins of Brookline, Massachusetts. He received his patent number DES 166995, June 10, 1952. It is strange the glass model did not sell as well as the plastic models that followed. 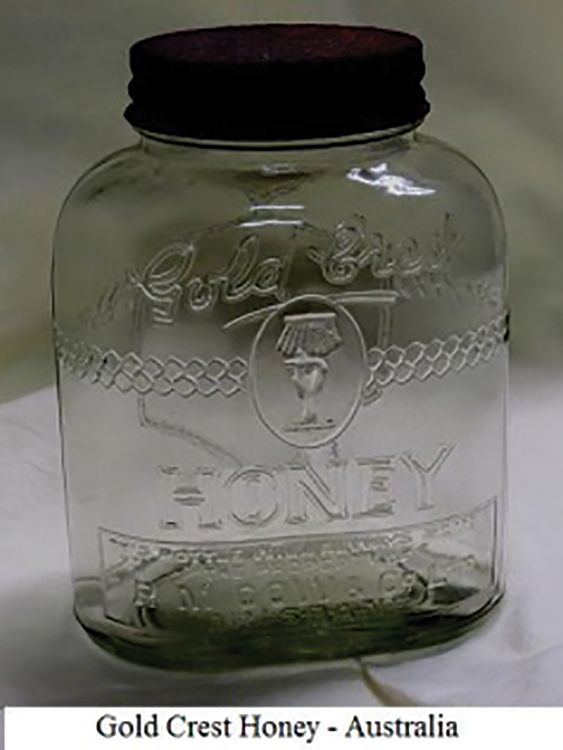 This is a very unusual honey jar that was used by the R.M. Gow and Company Ltd. of Brisbane, Australia. 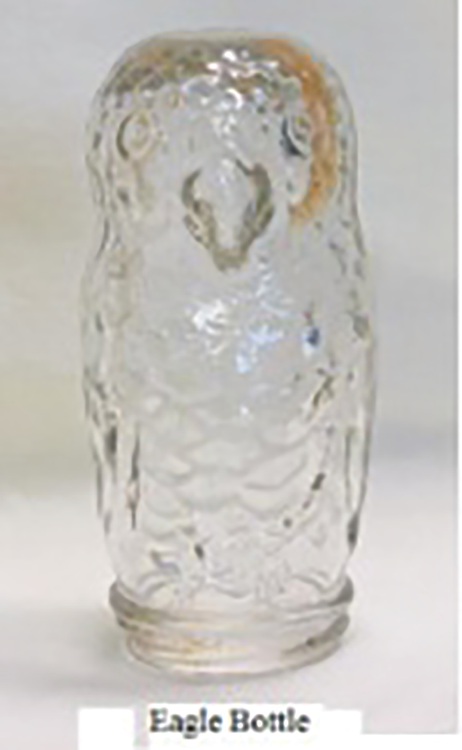 It is a very ornate bottle with lots of embossing and the hexagonal patterns are orientated in the correct direction. The reason that you do not see many of these bottles are due to the inscription that “This bottle will always remain the property of R.M. 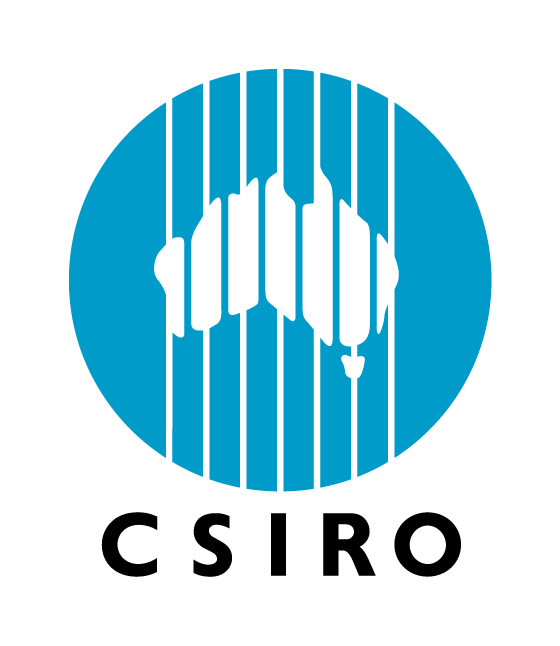 Gow” and it was produced in Australia. Robert Milne Gow established the Gold Crest brand of his food products in 1926. 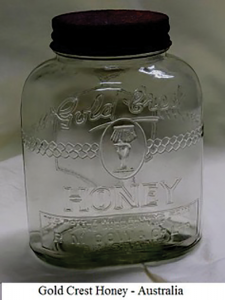 H and H Brand Honey embossed bottle contained three oz. 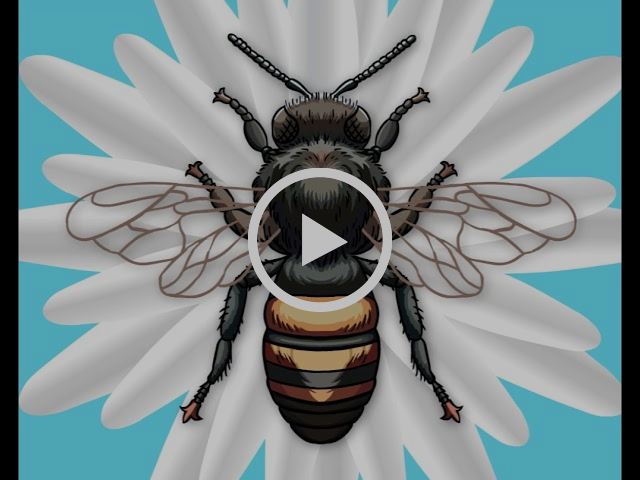 of honey. Since this bottle is embossed, it is earlier than one that I saw that had a label that was dated 1915. They had their honey operation in New York. The Hazel-Atlas Glass Company of Wheeling, West Virginia started out at Washington, PA and later plants included Clarksburg, WV; Zanesville, OH; Ada, Oklahoma; Montgomery, Alabama; Oakland, California; Pomona, California and other locations (1902 – 1964). 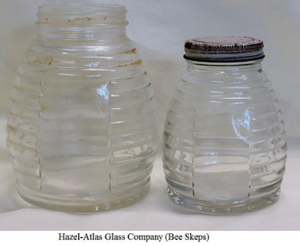 Hazel-Atlas made the Beehive Jars and listed them in 1935 Bee Culture magazine. They were made in three sizes from ½ pound to two pounds. Two of the jars on display have model markings of 5110 and 5111. The Killions of Illinois were strong supporters of these jars. 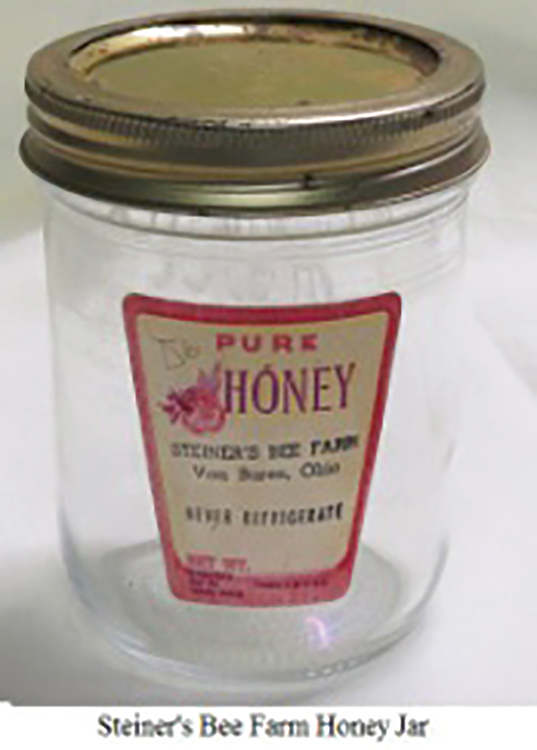 The Hazel-Atlas Company also made other honey jars such as the Skyline and tall cylinders. 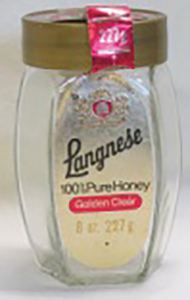 Other Hazel-Atlas Honey Jars includes the Skyline jars, round tall cylinders, and the Exceline jars. 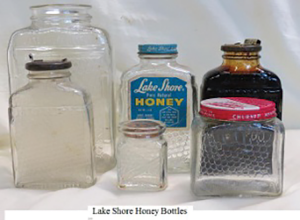 These jars were introduced to the market in 1936. 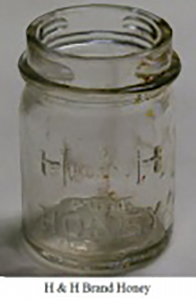 The Skyline and the Exceline jars were made in ½ pound to four-pound jars. The round cylinders were made in 1¾ ounce to three-pound jars. A sample of the round cylinder jar is shown by the Land O Lakes bottle. 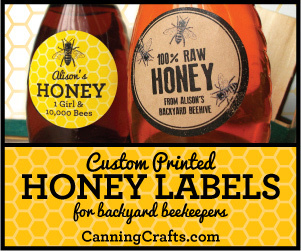 They also made a 2½ square jars that makes an excellent chunk honey container. A two-pound vertical ribbed queenline jar is also on display. 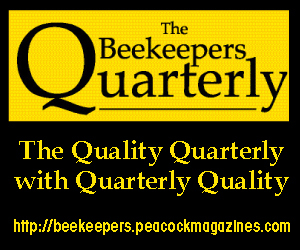 Hexagonal Jars are available from most bee supply dealers. 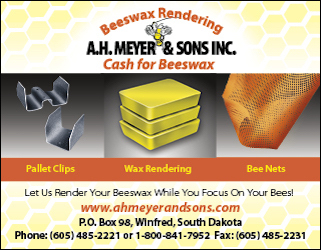 Some of the sizes available are: 1.5 oz., 3.75 oz., and 9 oz. These jars make good gift bottles but are generally too small for show requirements. The original patent 1,073,459 was granted September 16, 1913. 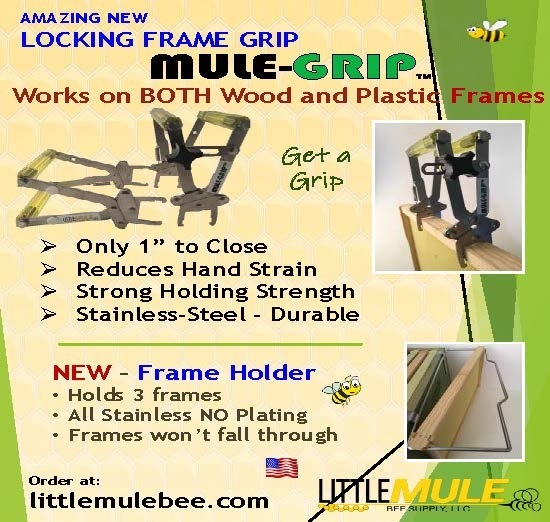 Similar Octagonal jars are also available. 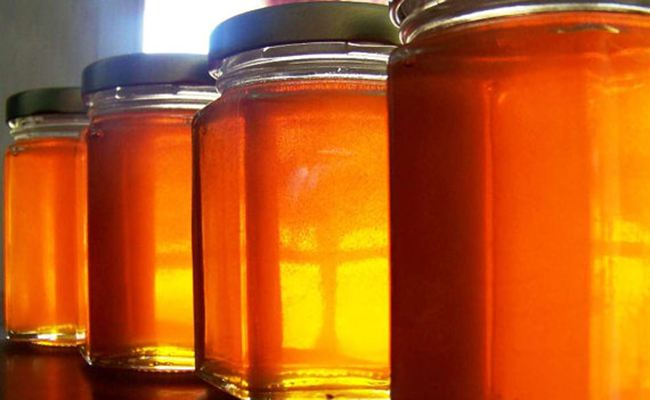 Mason jars are not normally used to sell honey in as there are better jars to show off the honey. 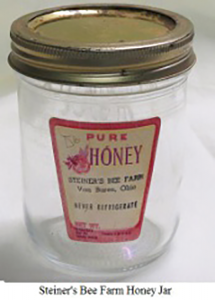 However this wide mouth jar was used by the Steiner’s Bee Farm from Van Buren, Ohio in 1960. 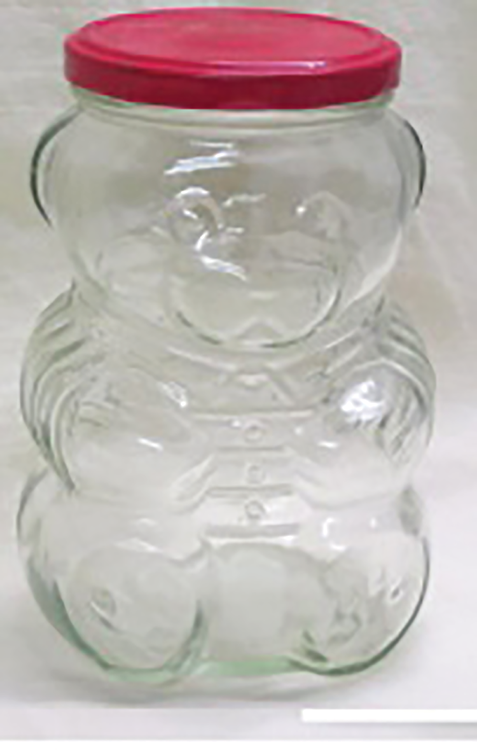 This type of jar is for selling chunk honey. 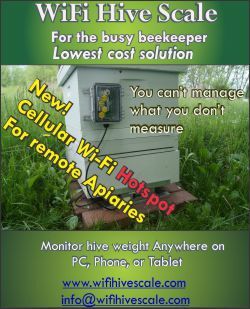 Mr. Steiner was one of the beekeepers that changed the bee inspection system in the 90s. 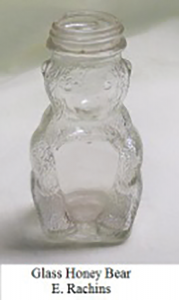 Kraft Foods marketed honey in a 5¾” glass bear in 1988. 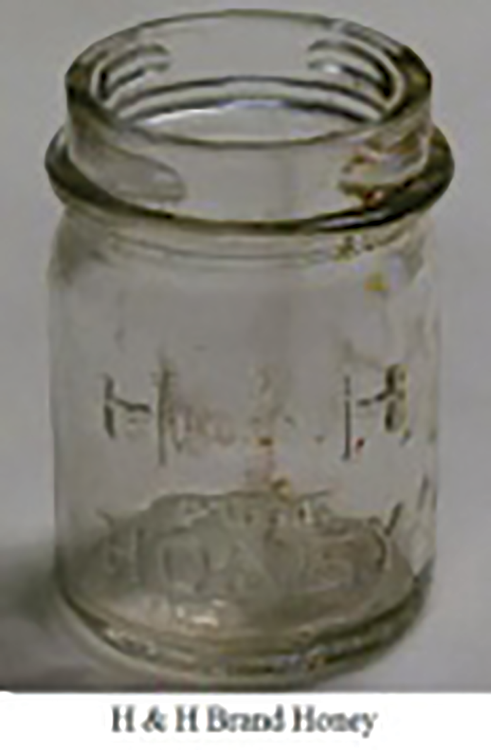 The jar was made by the Consumers Glass Company, Ville St. Pierre, Montreal, Quebec, Canada. 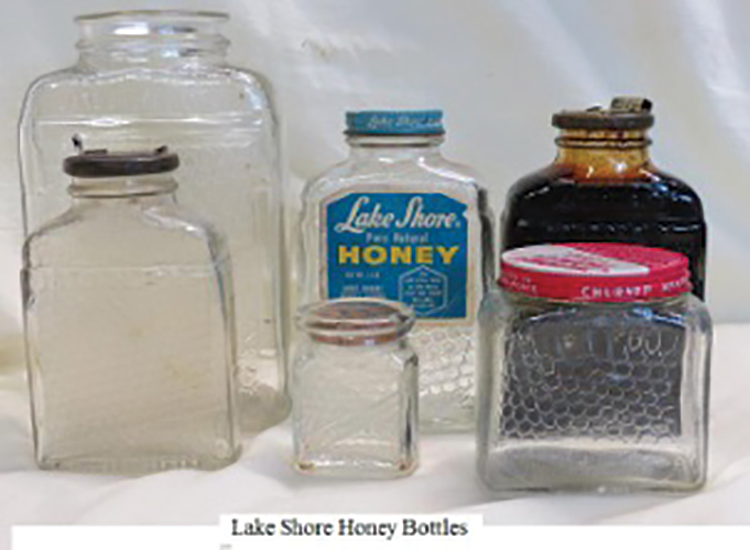 The Lake Shore Honey jars were made in many sizes and had different types of closures. 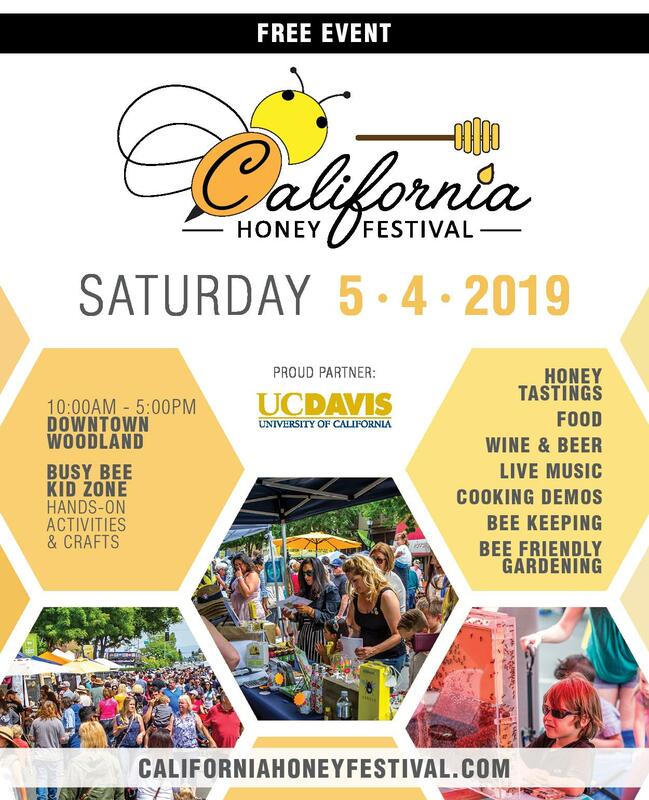 They sold extracted honey and chunk honey. 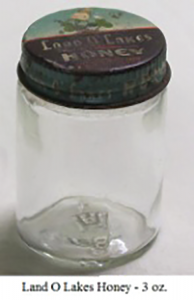 The most common type of closure was the sliding top, but on some models of jars a cardboard top was used. In later years a screw top cap was used. Walter F. Straub was at the helm of the company that was near Chicago, Illinois and held the three patents on the jars. The patents were granted in 1932, 1933, and 1935. This jar is currently displayed in the museum show case. 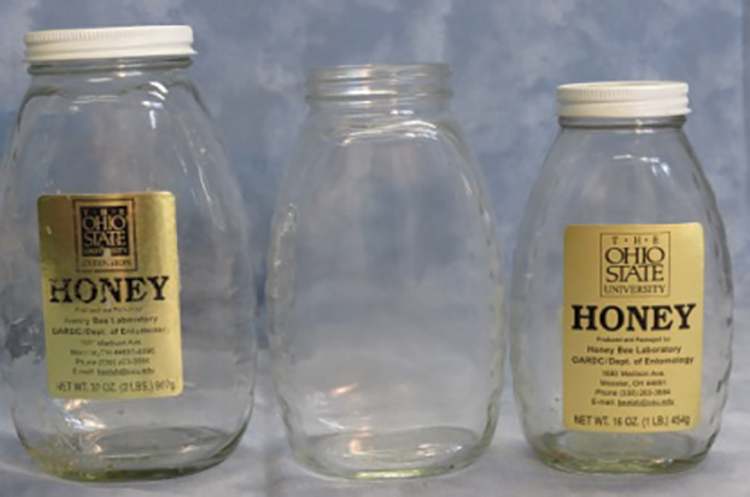 Next time we’ll continue this historical look at honey containers down through the years. 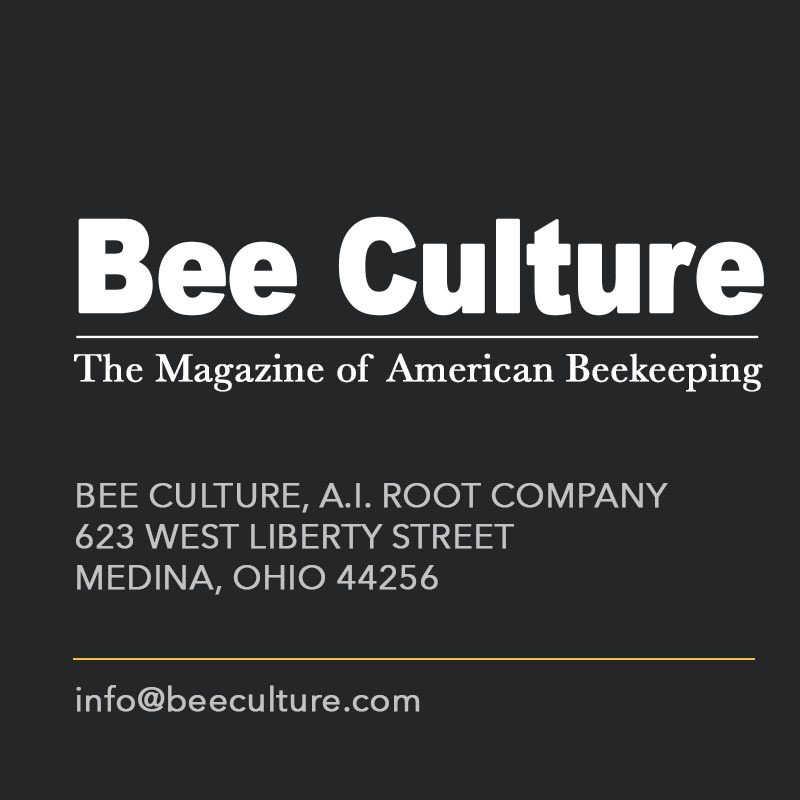 Jim Thompson is a long time beekeeper and beekeeping historian, living in Smithville, Ohio.